BedSlide Spring Offer on rack systems at CARiD + Gift! 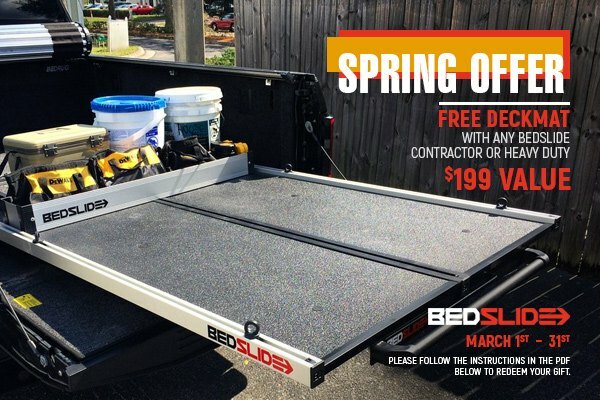 CARiD is here with yet another amazing offer on BedSlide Truck Bed Drawers! To help you load and unload your truck easier and provide you with an easy access to your belongings without a need to climb into the truck's bed, BedSlide offers custom fit slide out bed rack systems. All Bedslide systems are engineered to ideally adjust to your specific loading needs. Moreover, they are durable and strong enough to hold up to 2,000 lbs of weight. Don't miss your chance to save on your purchase, get your BEDSLIDE slide-out rack system and get a $199 value DeckMat for free! Additional bed protection never hurts! This is a limited time offer, valid until March 31, 2018. Feel free to shoot me a PM if any additional questions appear! Easier access to your cargo and gear with BedSlide + Promo! Don't miss BedSlide Offer at CARiD and get FREE Gift! Great offer from Steelcraft at CARiD - act now! Quick Reply: BedSlide Spring Offer on rack systems at CARiD + Gift!